In the last couple of years I have made different types of breads. But a couple of things are pretty new to me, one is making stuffed buns and two is baking in cast iron. I have baked almost all my breads in aluminium pans but I have been wanting to make something in cast iron for a long time. Baking in cast iron pans has it's own charm because the pan has the ability to heat really well and hold the heat for a long time. The advantage is that everything in the pan cooks evenly and you also get a good crust on top and on the sides. For a while I was mulling on the idea of baking in cast iron and then I read the theme for this month's Bread Bakers. Our lovely host Karen from Karen's Kitchen Stories set the theme to garlic. I was so delighted as garlic is something I love to the core! 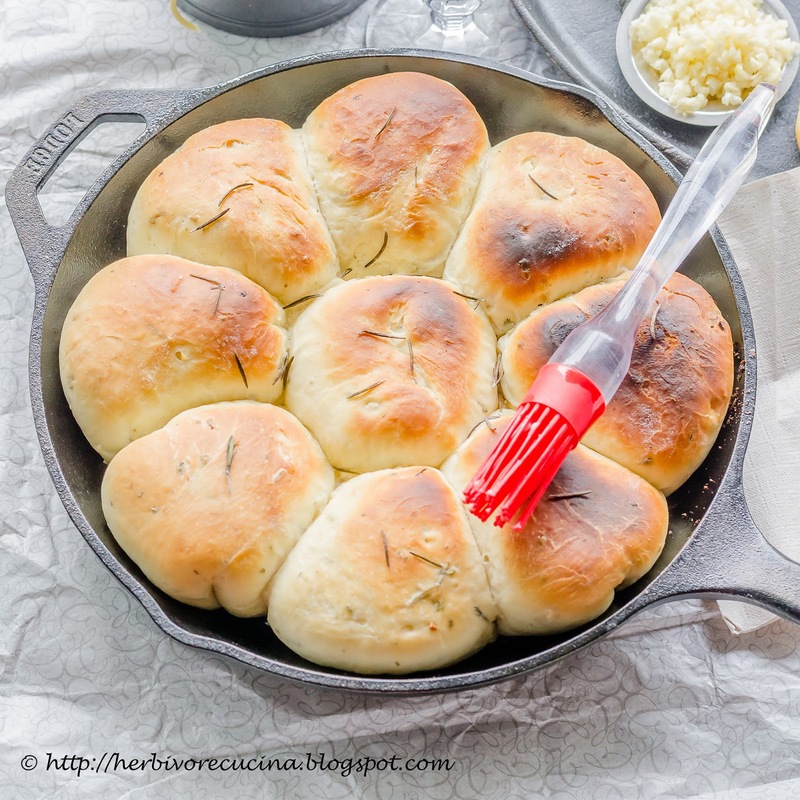 I thought of making a garlic focaccia, then garlic knots and then garlic oil infused bread. 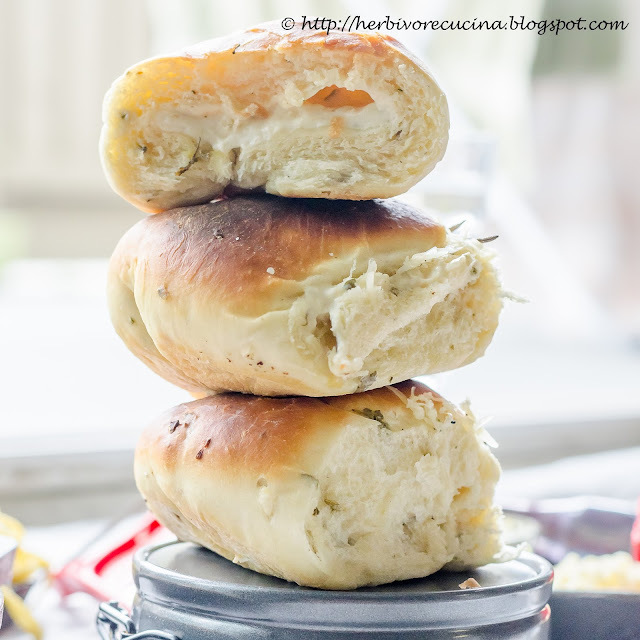 Finally I settled for a bread that combined the theme with my desire: Stuffed rolls, dough with lots of fresh garlic and baked in a cast iron pan. My refrigerator had a box of onion and chives cream cheese, and I decided to add minced garlic to that to make a stuffing. I also added some cheese to the filling as we all love cheese. The buns turned out really well. The buns were huge and one bun would make a perfect accompaniment for breakfast. 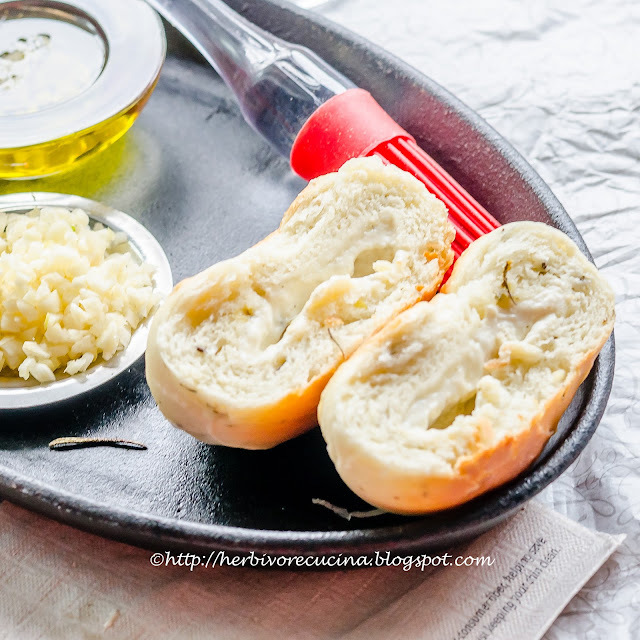 The bread had a lot of flavor of garlic, and the molten filling was full of creamy and cheesy garlic, onion and chives. As a family we love garlic, so I added lots of it. If your family does not relish it as much, you can reduce the amount or eliminate it completely. I had chives and onion cream cheese so I used it. However, you can use a different flavor depending on your preference. I baked them in a cast iron pan, but they taste equally great when baked in an aluminum tray. Do try this at home and yes, don't forget to see the long selection of garlic infused breads that everyone else made for this event. In a cup add water, sugar and 1 tsp salt. Warm the water to 100-110 F, add yeast, mix and let the mixture stand for ten minutes till the yeast blooms. In a large mixing bowl, mix flour, 3 tbsp unsalted butter, minced garlic, 1 tbsp garlic powder and 1 tbsp oregano. While the dough rests, prepare the stuffing. Mince garlic and jalapeno. Mix all the ingredients under stuffing and beat to a smooth mixture. Set aside. Once the dough is almost double it's size in 45 minutes, punch it down and knead it for 5 more minutes. Now line a cast iron skillet with nonstick spray or oil. Divide the dough into equal sized parts. I made ten out of my 3 cup dough. take one part, roll it out to a disc of 6-7 inches diameter. Add a big portion of the stuffing, and roll the dough to a smooth ball. Place it in the greased skillet. Repeat for all the dough parts. Place all the buns in the skillet, leaving some place between them. Brush them with little butter, and add rosemary on top. Let the buns rest for 20-25 minutes till they rise. Preheat oven to 400 F/ 200 C. Place the cast iron skillet in the preheated oven. Bake for 8-10 minutes till the tops are a little brown. Remove and serve warm with a side of olive oil with minced garlic in it or just marinara sauce. If you like, add some shredded cheese on top too! 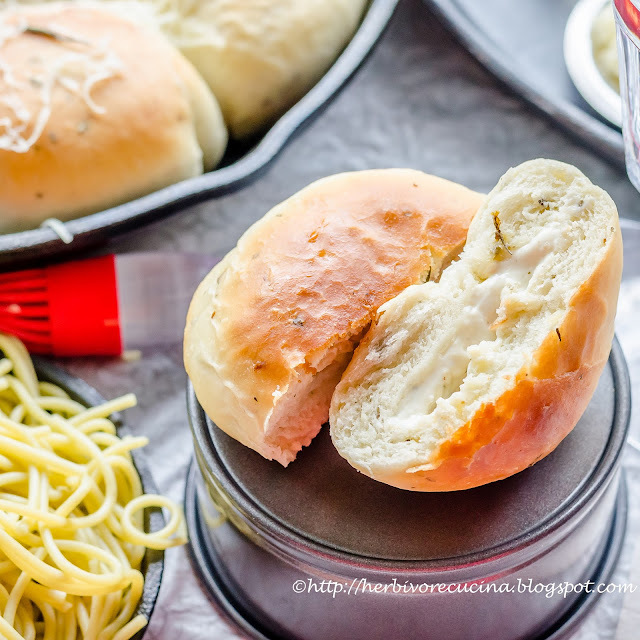 What a great pan of rolls, and I can just see how moist they are! These look seriously amazing. You nailed it!! Those rolls are to die for! 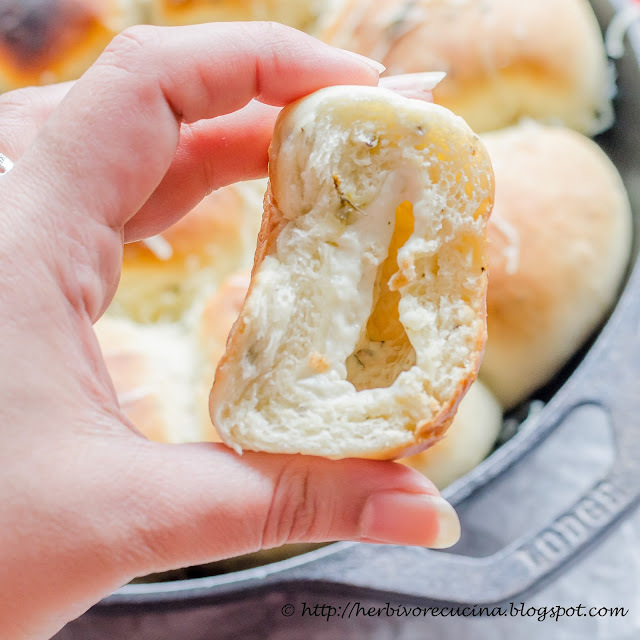 I'm a total garlic lover, and I love the cheese in the middle of your rolls. 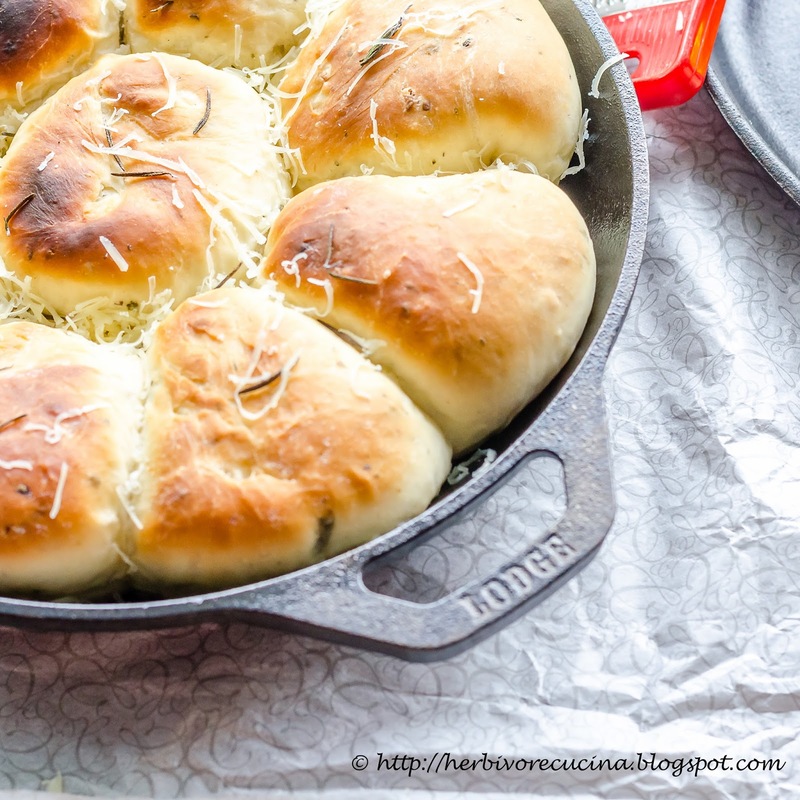 I'm going to have to bake rolls in my cast iron pan. I bake bread in it all the time! These are such a beauty Smruti. 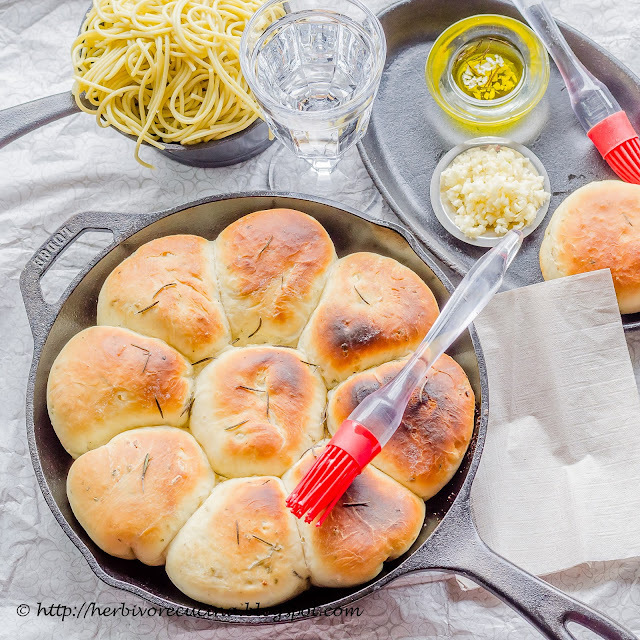 You definitely did more than justice to the theme and to your desires to bake in a cast iron and that of stuffed bread! These sound delicious! That filling is too good! Those are gorgeous rolls and have inspired me to bake with my cast iron pan too. Cream cheese and garlic sound like a winning combo. Beautiful! The filling really puts these rolls over the top! There would be no way I could stop at eating just one of these. 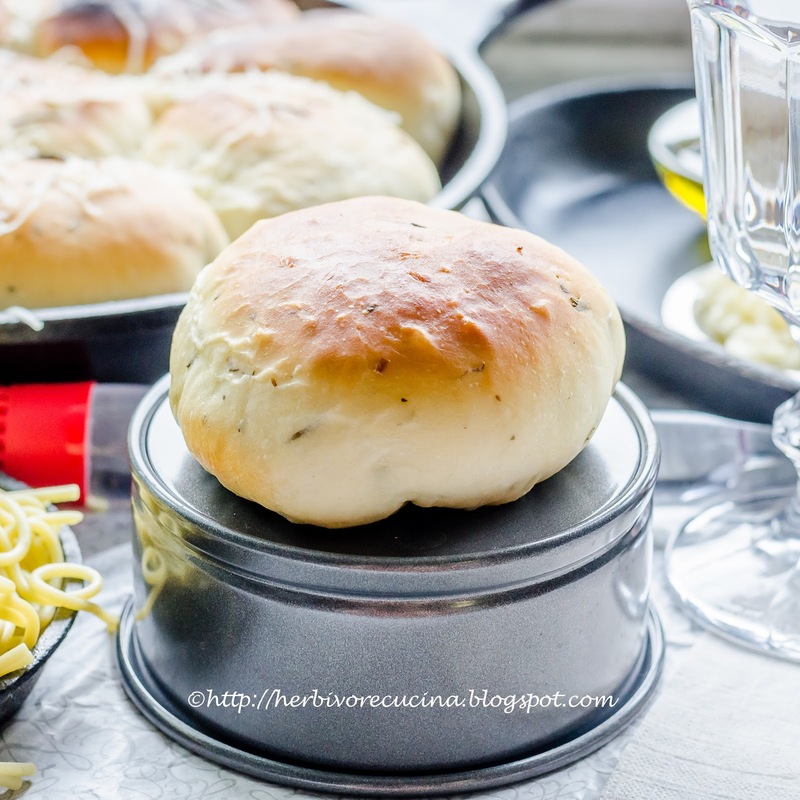 Rolls stuffed with cream cheese and that too garlicky sounds really good. I've never baked in a cast iron pan, but really am tempted to.., heard so much about getting a beautiful crust and bottom. Now got to convince hubby to buy me one as they are expensive here. Wow Smruiti your rolls look fantastic! Love the idea of filling them up with cream cheese - sounds really appetizing! By the way, I love your pictures too! Great photography! 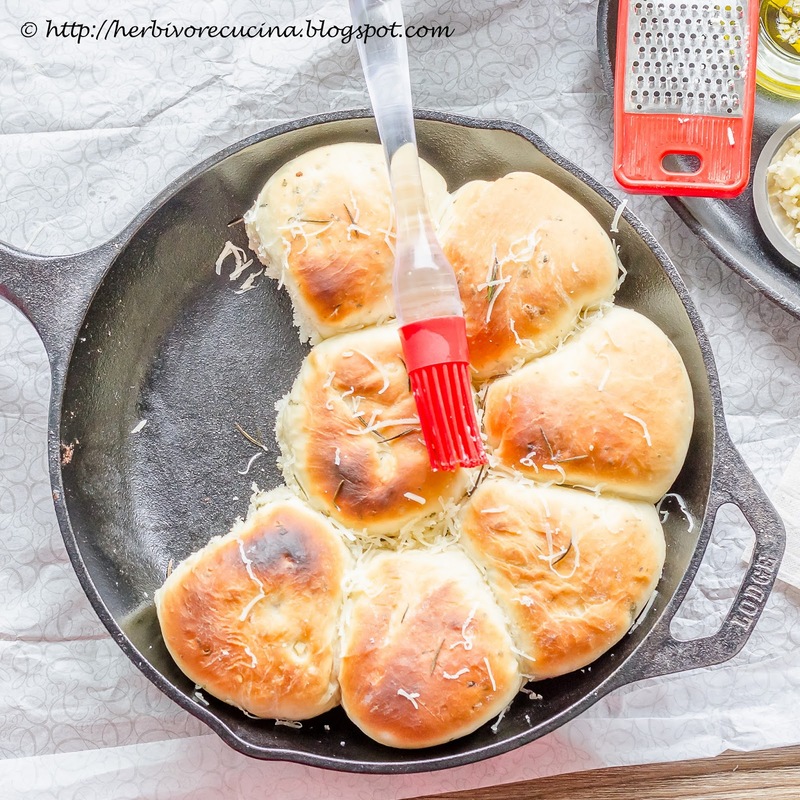 Irresistible cheesy garlic rolls, can't stop admiring them. Okay. Wow. I'm hungry just looking at that wonderful pan of rolls. Thanks for sharing with the #BreadBakers.